We've just finalised details of the special free Swim Smooth open water skills session which will take place on Saturday 11th July at 3pm. Our coaches will take you through some simple exercises to get you comfortable and relaxed in the water whilst tuning up your open water skills such as drafting, sighting and swimming straight. You'll also get a good look round the swim course from on the water giving you an advantage come race day! We've also just released a new analysis to Youtube of 7-time World Marathon Swimming Champion Shelley Taylor-Smith (arguably the greatest marathon swimmer of all time). 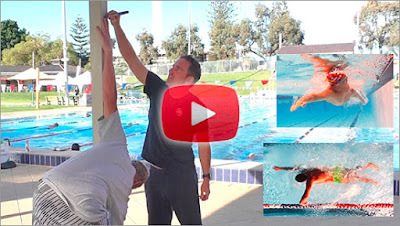 This was recorded in April during our certified coach training course in Perth. The clip finishes with an interesting discussion on arm recoveries in different conditions. Shelley says (paraphrased) : It’ll be really interesting to see the strokes at the Rio Olympics next year. The 10K swim at London 2012 was in a lake with perfect flat water but Rio can get rough. We won't see many high elbows! Is she right? We'll find out in 2016! Back in the 1990s they said that everyone should swim the same way, how we should all aim to make our strokes as long as possible. How we should all try to match the stroke length of Olympic Champions. These days we understand that making your stroke as long as possible actually isn’t efficient swimming - you need to find the right trade off between the length of the stroke and your stroke rate (cadence) for you as an individual. This is in fact what Olympic Champions do - although many have long strokes, they could go even longer if they wanted. 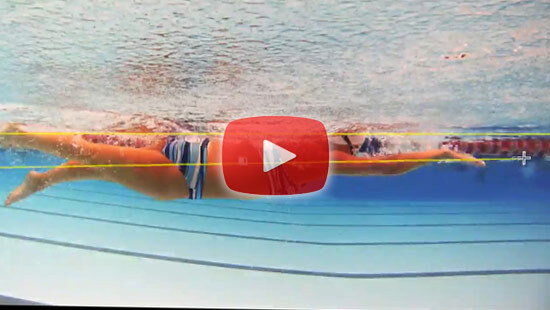 The short video above shows a great example of two swimmers of very similar speed - Brad Smith and SS Head Coach Paul Newsome - both swimming very effectively but with very different stroke styles. Each swimmer has taken account of their own physical make-up to find a stroke that works for them. You should be aiming to do the same, even if that means going against what was historically considered to be an 'ideal' stroke. ...featuring Neil, our current Ape-Index world record holder! - Added a full strength and conditioning routine for swimmers. - Added Paul Newsome's video analysis of elite triathlete Rachel Joyce (2011 ITU Long Distance Triathlon World Champion & 2nd Place IM Hawaii). - Added Paul Newsome's video analysis of Terenzo Bozzone (2008 Ironman 70.3 World Champion). - Added 20m pool option for beeper settings. - As previously announced, added a brand new Brownlee Tri Sprint Training Plan - perfect for beginners swimming an open water triathlon for the first time. - Improved webapp responsiveness on touch devices. Perhaps our most popular ever blog post here on Feel For The Water was our case study of Megan Surrette, an open water swimmer from here in Perth. From 2012 to 2014 Megan reduced her threshold swimming speed from 2:12 to 1:32 /100m - a HUGE improvement that justifiably earned her the nickname Mega Megan! If you missed it the first time around, see how she made such a staggering improvement on the original blog post here and in her video review on Youtube here. So that was a year ago... what's she been up to since? As well as swimming the 13km Northumberland Strait in Canada (one of only two last year to achieve the feat without a wetsuit), she's been developing a very nice 2-beat leg kick technique to further improve her stroke efficiency. As she says on the video below, Megan achieved this using our two-beat kicking tutorial on the SS Coaching System.